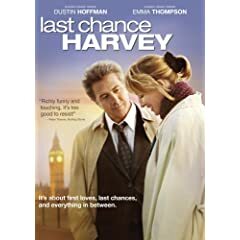 Harvey is a failed American husband, father, and musician who flies to London to attend the wedding of his only daughter. Kate is a lonely English woman who had spent her life playing it safe and expecting disappointment. When their paths happen to cross, Harvey strikes up a conversation with Kate, and they spend the rest of the day walking about London together. Kate is attracted to Harvey’s simple, humorous chatting-up approach, and he likes her straightforwardness. Over the course of two days, these two “failures” form a bond that just may last. Hoffman and Thompson turn in a pair of subtly nuanced, genuine performances in which each “becomes” their character, allowing the audience to forget that they’re actors. In keeping with the overall mood of the piece, lighting and backgrounds are consistently muted, while supporting performances are competent yet ancillary. Last Chance Harvey is a wistful, gentle, and appealing little romance, perfect for spending a quiet evening at home. No bells and whistles here, just a really good picture. The quaint, picture perfect town of Sugar Maple in rural Vermont is far from ordinary, though you wouldn’t guess by looking at it. You see, it’s populated entirely by otherwordly beings – faeries, trolls, and the like. And the magical town has been protected from harm for hundreds of years by a special spell, and not a single crime has ever occurred. Now the spell is losing its strength, and the fate of Sugar Maple is in the hands of single, mostly human, yarn shop owner Chloe. In Sticks and Strings, “yarn never tangles” and “you always get gauge.” But the natives are getting restless, and they want Chloe to produce an heir to the spell. When an outsider drowns one night in the icy skating pond, and the state sends in a detective to get to the bottom of it. This is a fluffy, whimsical plot that demands total suspension of any sense of reality. 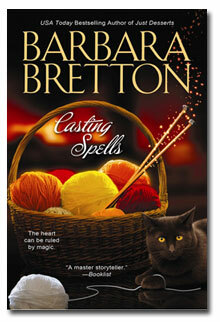 Recommended for those who enjoy light romance novels with a hefty dose of faery dust.